The Waikato region is rich in scenery, has a relaxed atmosphere, and a broad range of activities and attractions. 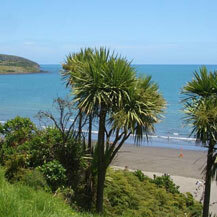 Waikato is a great base for any Central North Island holiday, located 90 minutes from Auckland, Tauranga, and Rotorua. New's Zealand's longest river, the Waikato River, carves its journey through this beautiful region. Found on the shore of this mighty river is the charming city of Hamilton. Hamilton is a city of education, parks and gardens, fine cuisine and cafes, culture and attractions. No trip to Hamilton would be complete without a visiting the Hamilton Gardens, which attracts around 600, 000 visitors annually. The Frankton Markets are popular with the locals and also visitors to Hamilton operating every Saturday morning. Like other central North Island locations, Waikato has a lot of geothermic activity and hot mineral pools. Te Aroha Mineral Pools are New Zealand's original thermal mineral pools and the world's only naturally flowing hot Soda Spa pools. A great year-round place to visit. For over 100 years millions of visitors have marvelled at the limestone glowworm caves in Waitomo. A boat ride through the labyrinth ancient limestone caverns and formations under a galaxy of tiny living lights is sure to be magical holiday memory. Exceptional surf beaches are found along the West Coast of the Waikato region. Raglan is considered one of New Zealand's premiere surf beaches and is a unique and idyllic town for holidaying. A short drive from Hamilton, is the lush, green hills and plains of Matamata. The catch phrase for Waikato is "where the grass is greener", and when you visit this region you can definitely see why. No wonder Peter Jackson chose this as the location to shoot Hobbiton for The Lord of the Rings movie. If it's for adventure or a relaxing break, the Waikato region has it all. The links below will help you guide your search through all the information on KiwiWise regarding the amazing Waikato region.